Edelbrock's valve cover breathers contain an effective filter which traps oil vapor and prevents engine compartment contamination. Each breather comes with rubber grommet or mounting hardware. Push in breathers will fit any 1-1/4'' diameter valve cover hole. 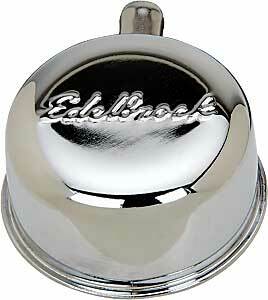 Edelbrock offers these breathers to match most common Edelbrock valve covers and air cleaners. Complete the look of your new Edelbrock valve covers with these matching accessories. Edelbrock offers oil fill caps, oil fill tubes, replacement grommets and crankcase ventilation kits to finish the job right! 4410 - Edelbrock Breathers and Accessories is rated 5.0 out of 5 by 1. Rated 5 out of 5 by Curteye from Perfect Looks great and works. I thought it said you need to buy the PCV. Don't buy the PCV, it doesn't fit in this breather.